This focus show introduces paintings, drawings and prints of Asian ceramic objects by Melbourne-based artist, Kevin Lincoln. 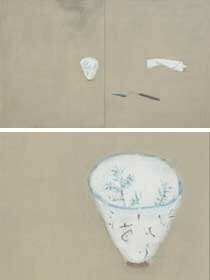 The tranquil, meditative aura of the still lifes, executed in subdued colour and with a great sense of space, pays homage to the simple, unadorned beauty of Asian ceramics, while the crisp lines and freshness of his drawings testify to the artist’s sharp observation skills and his deep understanding of form. Lincoln’s works will be exhibited among the ceramic vessels and sculptures from the Gallery’s and his own collections that have inspired him.